If you follow me on Instagram, then you'll know I'm sort of addicted to colouring my hair. I love to change colours all the time, the only downside is, my natural hair is fairly dark so it can be pretty tough constantly bleaching my hair to get my preferred shades. 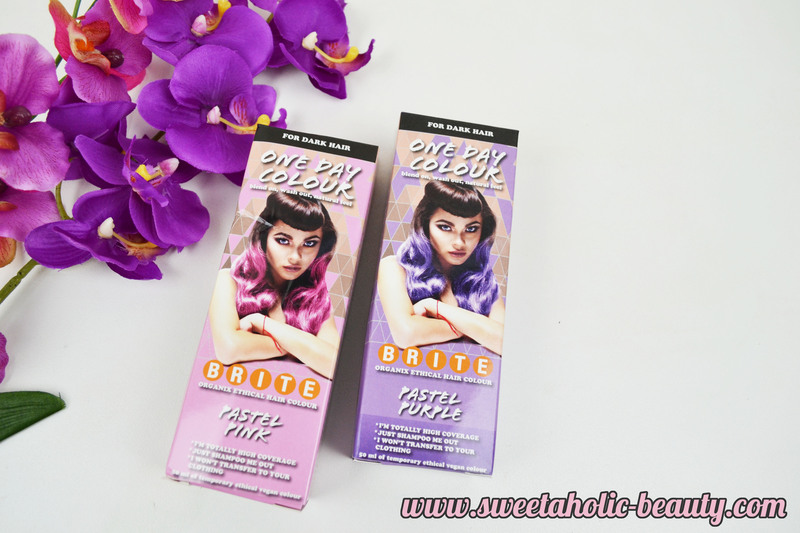 I was recently sent out the Brite Organix One Day Colour packs to try out on my darker locks. Sadly for me, I forgot about them until after I'd already bleached my hair, so I decided to still give them a whirl and see how they went. To be 100% honest, I didn't have high hopes. The box says this is specifically for darker hair, which already had me thinking that this was going to be a bust. The instructions tell you to apply to your hair, dry, and voila - beautifully coloured hair. I was skeptical. I received two shades to try out, pastel pink and pastel purple. The actual - stuff - comes in a little bottle which made it a lot easier to apply. It wasn't something I had to mix up and use only once, I could keep this and use it whenever it suited me. This applied like a wet mousse, just run through your hair and then wait for it to dry naturally, or dry it yourself with the hairdryer. I didn't want to wait, so I dried it with the hairdryer. It took only a few minutes, and it was done. I brushed it through and it felt like normal hair - no stickiness or stiffness, or anything like that. Hmmm, looking good so far. I also decided to straighten my hair as well, no staining of my straightener or anything. It felt just like my regular hair, and I didn't even notice there was colour in it. I kept the colour in for three days before washing it out, and my hair was like normal again. As this was specifically for darker hair though, I wanted to try it out on my partner Alex, who has black hair. Right now he has his hair practically shaved, but he has been sporting a pretty rugged beard. 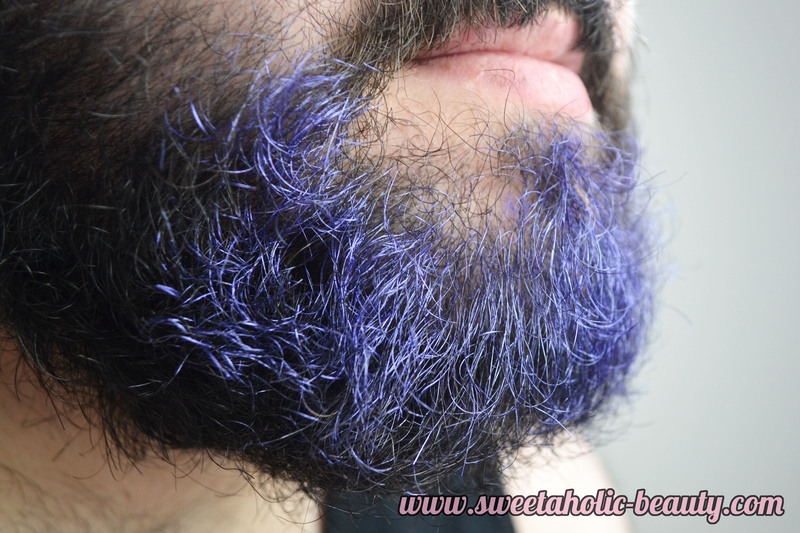 He was going to shave it off, so I may or may not have attacked him with the pastel purple. I was really impressed at how well this worked out, and he was almost tempted to keep it for a day just for the fun of it. I was actually super impressed with the Brite Organix One Day Colours. They worked so well on both lighter and darker hair, and they were so easy and safe to use. I also love that this brand doesn't test on animals, and this particular product is also vegan. I think I've found my new favourite hair brand! I can't wait to try out a few other things they have on offer and let you know my thoughts! 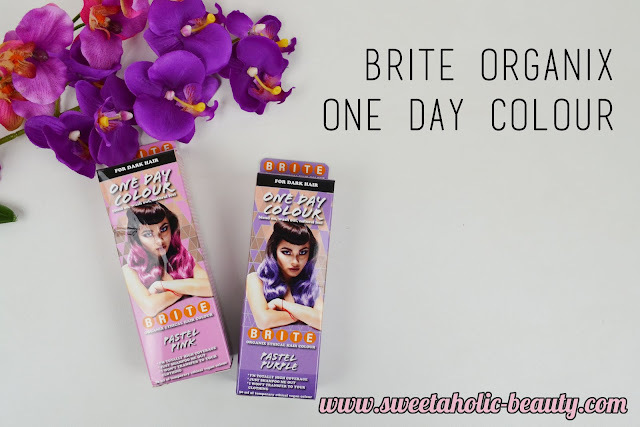 Have you tried the Brite Organix One Day Colours for Dark Hair? If so, what are your thoughts? Would you consider using something like this? You can purchase the Bright Organix range direct from their website. I love how this looks on you! I like the way it actually came out on dark hair. What a cool product! I've never heard or seen anything like this before. 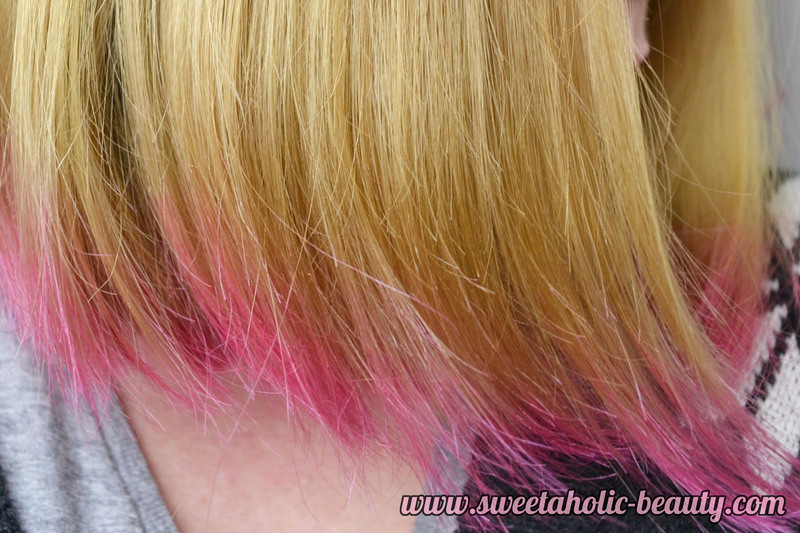 It's a great concept for those who want the fun of cool colours and not the hassle of salon appointments. I've just dyed my hair blue so I won't be needing this haha. Nice work with the sample colour on the facial hair heehee. Fun! I've seen these in the supermarket and wondered how good they really were. I have ombre hair with the ends about your colour so I am enthused by the results and will put it to the test next time I have some sort of fun event to attend! I would love to try this! This looks so amazing! It's great this works on darker hair without bleaching it! Thanks for linking up to the Monday Makeup Madness link up party. Loved the look of this so much I have now ordered some!